I was nominated for the Liebster Blog Award back in January by Nessa of Sewing Empire, but I completely forgot about it! However, I've found it again just in time for CoBloWriMo, or Costume Blog Writing Month, which I'm attempting to participate in to at least some degree. The rules, as you may know, are to answer the interview questions set to you, list eleven bloggers with fewer than 200 followers* to receive the award (and notify them of their nomination), and come up with eleven questions for them to answer. It's interesting, though, how memes change - when I went back in my blog to get the URL from when I uploaded the graphic years ago, I found that the interview aspect wasn't a part of it then, apparently. What is your favourite fabric color / pattern you enjoy working with the most? Blue. It's my favorite color and I gravitate toward it for my regular clothing (right now I'm wearing a blue t-shirt and blue sweater, not as part of a coordinated outfit but simply because of the laws of probability), so I also tend to gravitate to it for historical sewing. Blue linen is a good bet for many eras, and if you make most of your things in the blue family they all go together, see? What is your most favorite place / space (be it a room, building, holiday destination etc.)? Edinburgh might be my favorite city. I did my junior spring semester there in undergrad, and it really clicked with me - the city center is very historical and very walkable, the climate is temperate, and it's humid all the time which makes my hair curly. When the air is cool and damp, the sky is overcast and low, and it feels like it's absolutely capable of raining and yet it doesn't, I call it an "Edinburgh day" and get sort of homesick for it. Do you have a favorite TV show or movie? If yes, which? I don't know if I have a favorite ... I really love Scandal and Game of Thrones, though. Maya & Marty has only just started, but it's wonderful. Is there something you like to collect (fabric, ribbons, buttons, cups etc.)? antique clothing: I've mostly bought these pieces because they happened to stroll by at a very reasonable price, or I was given them. Natalie Ferguson very generously gave me her collection not long ago, and I hope to write about some of the wonderful pieces in it this month as well. academic texts on the eighteenth century/colonial period/early Industrial Revolution. small potted plants that can survive in my north-facing windows. If you could travel to one of your sewing era(s), which one would you like to visit most? Is there a specific date/place you would go? I would really like to visit the 1890s/1900s. As you know, I have a kind of nostalgia/anemoia/mono no aware feeling that currently is focusing on the turn of the century. When you read period texts, it's clear that they felt a lot like us about their world: that it was fast-paced and modern, with social customs changing and technology adding both opportunity and complexity. At the same time, I have a fascination with the late Middle Ages/early Tudor period that I can't really explain. I'd like to visit a totally pre-industrial time as well. What is your favorite novel / author? My go-to comfort reads are the Pagan Chronicles, by Catherine Jinks. They follow Pagan Kidrouk, a Christian Arab in the 12th-13th century, as he becomes a squire to make some quick money, then follows his knight back to France and then into a monastery (and then one last book is centered on his daughter). I'm sure their historical accuracy is iffy - from what I've read elsewhere, the idea of a united, widespread Cathar heresy is now generally considered by historians to have been exaggerated/fabricated for political purposes - but they're tremendously entertaining stories with a well-drawn protagonist. Do you have a favorite museum you would like to visit or go to visit time and again? I would really like to visit the Victoria & Albert Museum. I've been to London twice in my life and never knew it was there! Which is the absolute dream fabric or notion you would really like to work with, cost notwithstanding? I would really love to have a bolt of good silk satin in a period-accurate weight/hand to make a replica of a particular pink satin gown and petticoat held by the New York State Historical Association. And I guess I would need another length of contrasting satin to make the trim. Is there a new sewing or crafting skill you would like to learn this year? It's unlikely to happen, but I would really like to improve my bobbin lace skills. I understand how it's done, but I haven't done it anywhere near enough to be able to make lace that could be used in sewing. A couple of years ago I bought an antique roller pillow at an auction in order to get better and be able to make lengths of lace, but it hasn't happened yet. Which sewing / dressmaking task do you enjoy / eschew the most? My least favorite sewing job is setting in zippers. It's never really that bad, but I hate doing it and always put it off for days. I might enjoy hemming the most? Because once you take out the last pin and tie off your thread, you can shake out the dress and put it on! Where is your favorite place to sew or craft? Although I prefer hand-sewing, I love to work at my machine. - What is the history mystery (including but not limited to historical fashion) that you would most like to solve? - What is the period or area of historical dress that you first began to concentrate on? - Do you belong to a costuming or reenacting group? - What is an area that you fancy studying or sewing that you do not currently do? - Is there a particular technique that you'd like to learn, but haven't had the time or a project to do it in? - What would you make if time and budget (and event) were of no concern? - Is there a particular museum exhibition you'd like to go back in time or travel across the world to see? - What's your favorite reference book or fashion history text? - If you could design your perfect historical reenactment event, what would it be like and where? - What motivates you in your historical recreation and/or public education? Thanks for the nomination! These are great questions. Interesting report! It's good to learn about the backgrounds of fellow costumers/historians. Lucky duck to have studied in Edinburgh! Your Singer treadle is a duck. I have a slightly later model with the Egyptian decals, but with a similar shuttle and bobbin winder arrangement. 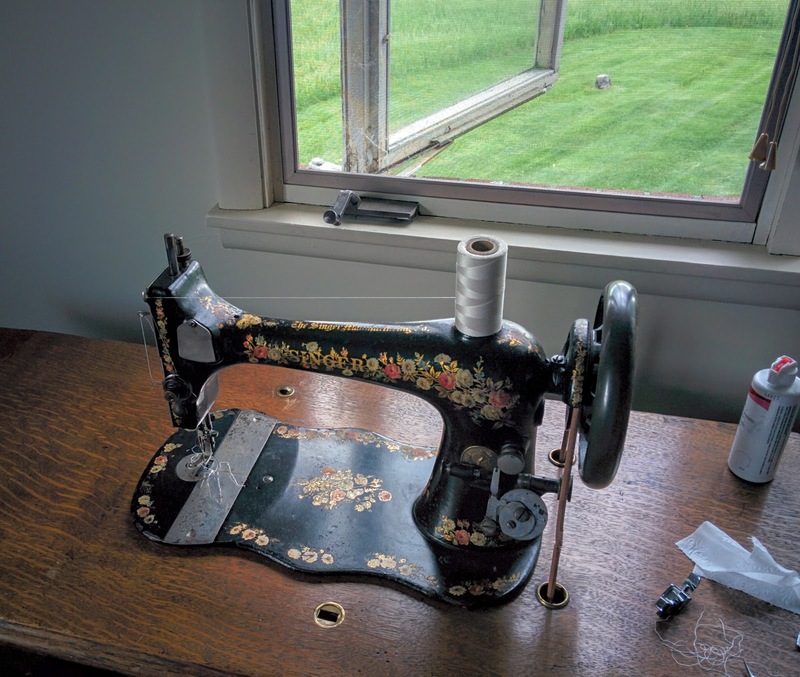 It belonged to my husband's grandmother and was in constant use on their KY farm; she made most of their clothes. Don't use it, though, preferring a 1911 handcrank. Do you use your attachments much? Always found the hemmers particularly good, and the ruffler isn't bad, either. Thanks for the kind mention, by the way. It's good to know that the collection might be handy. It's hard to keep from collecting, but at least I've narrowed the focus to lace only, and that in eeny bits that can store in tight quarters. Kudos to your for trying your hand at bobbin lace. It's such a high-level skill. I loooooove the Egyptian decals! Those or the Red Eye style were what I was originally looking for when I started browsing CraigsList for an older machine. I don't actually use the attachments - I bought a puzzle box with a whole bunch of feet, but I can't seem to work out how to use them, even with a PDF copy of the manual. I still do want to draw patterns from the collection, and hopefully I will start on that soon. And what an amazingly lovely sewing machine! Thanks for sharing a picture of it.